I don't really remember having many Valentine's Day books growing up. None that stick out in my memory anyway. Nor do I remember having many favorite shows. My all-time favorite doesn't really fall into this little category I've created for myself, because I never stopped watching it. That would be Be My Valentine, Charlie Brown. Peanuts never go out of style. 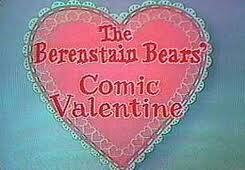 But we did have a VHS tape of The Berenstain Bears' Comic Valentine! The special first aired in prime time in 1982. We taped it off back-to-back with the I Love the Chipmunks Valentine Special. The Valentine's Day That Almost Wasn't was a special that aired on Showtime during the 1980s. It was created by Paul Fusco, better known as the creator of A.L.F. This is one of those things that I know I loved and watched many times as a kid, but I'd completely forgotten about it until one day, my sister sent me a clip from YouTube. After that, she managed to dig out the old VHS tape my dad had made of the special, but my VCR no longer worked. Now I can't remember if we gave the tape back to my sister or if I've managed to misplace it somewhere in this house. I have a working VCR now! I'd love to see this thing in its entirety again! It's about a cupid named Sam, a character based on Humphrey Bogart as Sam Spade in The Maltese Falcon. An evil woman named Rubella Slime creates a hate potion, and she and her brothers are determined to turn the world into one without love. Um... yep. I haven't seen this thing in eons, so forgive me if that's really all I remember. These YouTube clips are all I can show you. Thanks, YouTube user who uploaded these. The Smurfs, Alvin and the Chipmunks, and ALF all in one post?? You are awesome. The ALF opening made me so happy the second it started - hadn't seen that in a looooong time! I want you to know I'VE GOT YOUR CAT!" I know! Poor Charlie Brown. Is that the one that's on Netflix? The girls have been watching some of those, but most of them are from the last decade or so, and I haven't given them a chance. They've watched "You're a Good Man, Charlie Brown," though! I took Big Sis to a dinner theatre production last spring, and she likes hearing the songs again, but with actual kid voices. My favorite Valentine's Day book was Cranberry Valentine. Did you read any of the Cranberryport books by Harry and Wende Devlin as a kid? I think they're out of print, now, which is a shame. Well, I just checked Amazon and it looks like Cranberry Thanksgiving is finally back in print but not the others. Anyway, I just absolutely adored them as a kid--made me want to live in New England so badly! I didn't know about the Cranberry books until a few years ago, and even so, I've only read Cranberry Thanksgiving. I should see if the library has any of the others.